A recent trip to Macon, GA –about a 4 hour drive southeast of Birmingham–revealed an interesting downtown undergoing a revitalization. Above is one of the many blocks in the historic core whose streets are divided by large, park-like medians. Not only do these medians give the pedestrian an alternative to the sidewalk, but they introduce a large amount of green space into the core. Having that much space given over to trees, paths, and fountains in the middle of the street feels “Southern”: it implies a more leisurely pace and a warmer climate. On a weekday, these spaces including the one above appeared well-used. As a companion to those wide median-parks, the sidewalks on principal streets have extreme depths (above). In Birmingham we are often barely able to get a tight row of cafe seating on the sidewalk, where minimum clearances for pedestrians must be observed. This is clearly not a problem in Macon: the sidewalk allows large planting areas, sitting areas, and plenty of space for cafe seating and pedestrian clearances. At this point, however, there aren’t enough cafes, or foot traffic generally, to make these sidewalks feel comfortably occupied. The potential is there, however, as new businesses look to fill old storefronts. While perhaps several hundred apartments exist downtown, scattered in small developments, the city’s first large loft development, in the former Dannenberg Department Store, is underway incorporating several old buildings into a project of some 60 units and ground floor retail (above). Demand for housing downtown appears strong, helped by a medical center on the edge of downtown (sound familiar?). City leaders hope this project will be a “tipping point” for Macon, demonstrating the need for more housing, restaurants, and other services. 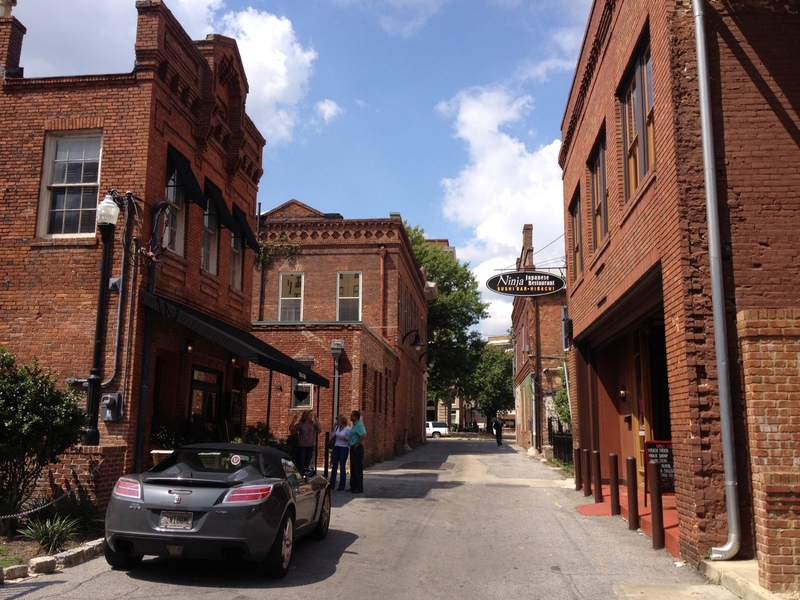 Part of downtown’s appeal to new residents is the system of alleys, called “lanes” in Macon. That nomenclature isn’t merely euphemistic; they are narrow, lined with quaint, small-scale architecture and landscaped areas and sometimes populated with restaurants (above). In Birmingham we often dream of converting our higher density alleys into pedestrian, mixed-use environments; but our system was and is almost purely about service: loading, employee entrances, etc. Transforming our alleys is a greater challenge, while Macon’s appear almost designed from the start for mixed-use transformation. An arresting sight downtown is the neoclassical facade of Terminal Station (waiting room, above), which has recently been fully restored and is poised to again become a center of rail activity if high-speed service is introduced to Atlanta. Ironically, Birmingham still has Amtrak service while our own gorgeous Terminal Station was torn down in 1969; Macon has no train service but managed to save their station. One wing is the now the main downtown transit center for city buses. 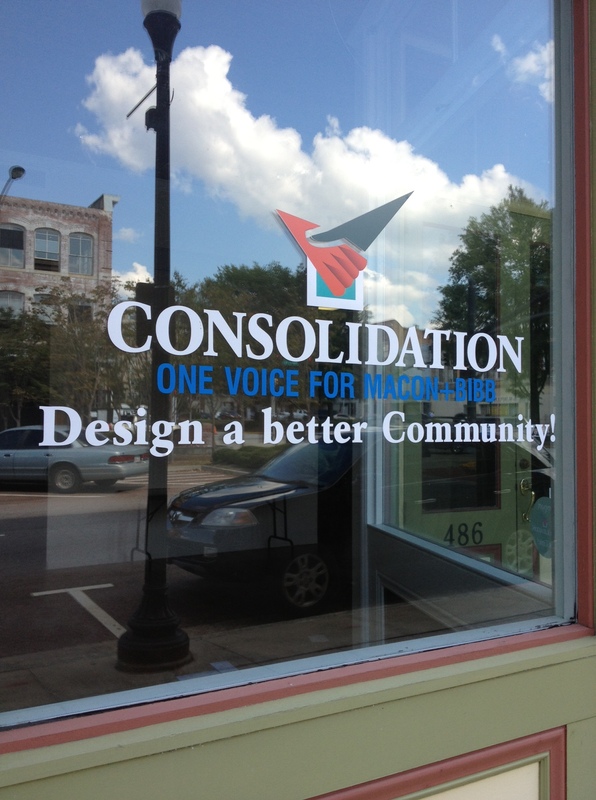 Spotted around the corner from Terminal Station was this storefront above, former headquarters of the consolidation movement which, just a few months ago, resulted in the citizens of Macon and surrounding Bibb County voting to merge as one entity. With the City and County speaking with one voice, it will make it easier to lobby for that train service, as well as any number of other initiatives. The politics, economics and demographics are different in Bibb County compared to Jefferson County; but it must be said that we are held back from achieving our true potential because our region doesn’t speak with that one voice. We waste too much time arguing amongst ourselves instead–rather than uniting for high-speed rail. Or a functioning transit system. Sometimes, small gestures can make a big difference. 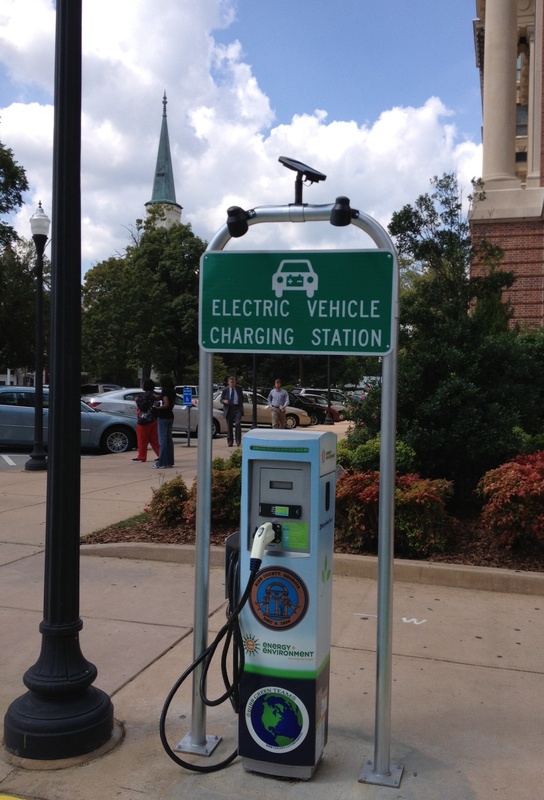 Above is an electric vehicle charging station outside Macon City Hall. Seeing this station has the same effect the (now removed) high-tech parking meters had outside Birmingham’s City Hall: the message is we’re moving forward, we’re embracing the future, we’re promoting efficiency through technology. Macon seems poised to become a real jewel of a Southern city, and we’ll follow its progress with interest. This entry was posted in Uncategorized and tagged Bibb County, Consolidated Government, Dannenberg Department Store, Jefferson County, Macon, Terminal Station. Bookmark the permalink. I just had a chance to spend three days in Columbus, GA leading a charrette for the GA Planning Association’s fall meeting. Columbus, too, has exceptional things happening in the downtown and along the Chattahoochee River. 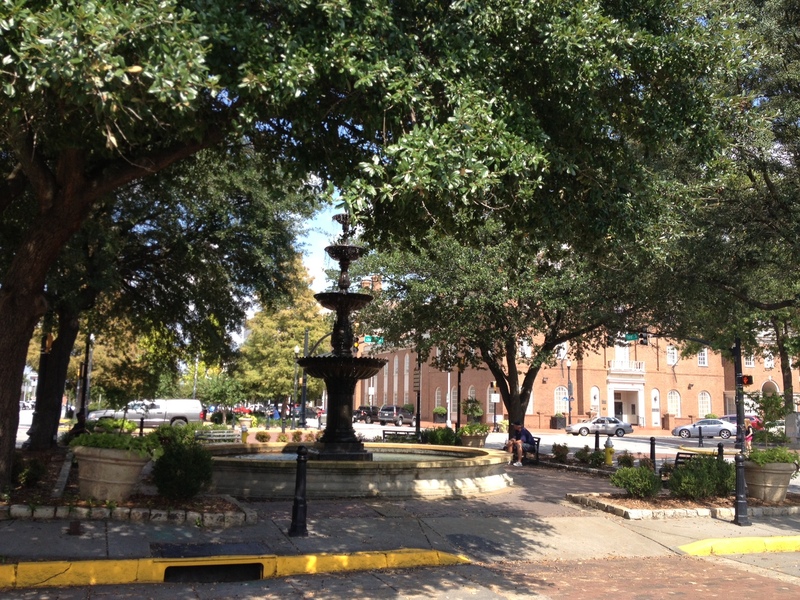 A downtown branch of Columbus College has contributed the vitality that you long for along those wide streets in Macon. Interesting. I know Macon is engaging its own colleges more actively in downtown; I spotted one historic building that appeared to be a branch facility of some kind. On a larger scale we are all encouraged that UAB could partner more actively with the surrounding downtown neighborhoods to create a mutually beneficial improved urban environment. Thanks. My God it’s come to this. We are trying to catch up to freaking Macon. Depressing. I didn’t mean to imply we’re trying to catch up–these are two very different cities, and you would never consider Macon a “peer” city; it’s too small. Small cities have some interesting attributes and advantages that medium-size cities like Birmingham can still learn from, however. As another example, Montgomery is not really a peer city–despite the population almost reaching ours (city, not metro–this is an issue, but mainly one of prestige/public rankings/federal funding). However Montgomery is doing some innovative things downtown that we could emulate for sure. Thanks. That is very nice. I see the compare and contrast between Birmingham and smaller southern cities all the time (Greenville, SC, Jackson, MS, Macon, Ga, etc). One of the major differences is the size of the downtown they’ve had to revitalize. Don’t get me wrong, Greenville is beautiful, but I explored that beauty in a matter of about 45 minutes. Literally. I have yet to see all that Birmingham has to offer even after hours of exploration. That’s good and bad. This means that it is a huge urban scape. Birmingham’s layout was designed to be the scale of a city much larger than what it turned out to be. The has led to problem it’s downtown being disjointed. I recall in an earlier post of yours that downtown Birmingham gets small pockets of nice things, but there is a lack of connectivity (just paraphrasing; correct me if I’m wrong). People visit and see vacant lots in the Civil Rights District, buildings in disrepair in the Theatre District, a lack of trees and varying levels of energy “Parkside,” and too much SPACE between all that Birmingham has too offer. This list of offerings is far larger than the few I mentioned, but with nothing joining these areas, in addition to the lack of upkeep, it seems very underwhelming. Greenville held my attention for every one of those 45 minutes. Whether it was a construction zone, greenery (we gotta stop cutting our trees…), office buildings, housing units, restaurants or boutiques, they’ve worked to make sure everything you look at is aesthetically pleasing. However, it was easier for them. This is not to take away from their efforts. I just feel that the comparison is somewhat unfair. Were every housing unit, eatery, entertainment space and Railroad park added to downtown Birmingham in the past few years added in these other places, they would neither have had enough space, nor the demand from the population. Conversely, had the only thing to happen in Birmingham been what those cities added, it would have been disappointing to me and I would not be considering moving to Birmingham to practice medicine after graduation. Good post, nonetheless! Excuse the length! This is an excellent observation, and one that I’ve made before in the blog, but should’ve reiterated here. Macon is much smaller. The fabric is smaller. It is often easier to come together and get things done in a small place because efforts can more easily be focused. You said it: Birmingham’s vast urban fabric is indeed a blessing and a curse. A Chattanooga or Greenville can feel more coherent with less, since the area is less. Thank you for reading. Wow, I thought that you really enjoyed your visit, just did not know how much. It was wonderful to show you around, I am hopeful you will get to know the city a lot better in the coming year! Thanks so much for the very gracious tour! I hope to know it better as well. And many thanks for reading the blog! Relatively new Maconite here. Macon is still a long way off, but in the 6 years I have been here I have seen a big change downtown already. A couple of years ago I plunged in both feet first and bought a house downtown. So far, it has been a great decision, and it has been great to see, slowly but surely, many of the houses around me get bought and refurbished. The most impressive thing to me has been what has occurred here in Macon in a very bad economy. Second most impressive thing is the way the colleges, businesses, and government have come together. I feel we have layed a good foundation here in a bad economy, and that if things start to pick up economically Macon is poised for great things. I got that sense too. It seemed that a good cross section of Macon society is really rooting for downtown–and the county merger seemed to just reinforce this. Thanks for reading! Thank you Jeremy, for writing such a thoughtful response to the city we love! I couldn’t help but feature your article on the i love macon (http://ilovemacon.org/) Facebook wall: https://www.facebook.com/ilovemacon. We hope you will come back and watch us grow! You are welcome–I didn’t know what to expect, and really liked what I saw. Thanks for the repost and I hope to come back soon too! @Chris–I respectfully disagree. I am a Macon resident, and whenever I come to Birmingham (family/business) I find myself charmed and enthralled with all your city has to offer. Birmingham is especially engaging downtown, and HOLY MOLY you have a Saks and a Whole Foods. I feel like Macon is positively rural by comparison. I don’t read this post as trying to catch up to anything as much as it is simply a study on a different locale. We here feel as if there are many problems/challenges/roadblocks to having a livable downtown that truly feeds the community. There is a concentrated effort in the “College Hill Corridor” to change things, but until people have the incentive to live downtown (amenities, grocery, nightlife, better food options, coffee houses) I doubt that will happen. While there are a lot of people trying to make a life in the city center, politics and clique-ish regentrification groups seem to prevail. Only time will tell. Enjoy beautiful Birmingham—I do!! As a former Maconite, and current proud resident of Kalamazoo MI, which is a bit farther along in the transformation process, I read this with great interest. It’s good to see some things happening in Macon; I will hope for even more! I can speak to Oscar ? I have lived in Macon all of my life and have seen so many changes. Our busy downtown area became a ghost town when the first mall was built. I thought it would stay that way forever. I am so thankful for the people who had a vision of what our downtown area could be again and worked hard to make it happen. Macon has always been beautiful and is now even more beautiful. Thank you for these wonderful pictures and thoughtful observation of the new and reborn Macon. Thanks for the positive input ! I am a lifelong resident of Macon (45 years ) and have seen many changes my hometown , good and bad. You are spot on with your information there is a living history and heritage in Macon and there are few cities left that can match the potential Macon holds . and hopefully consolidation will get us turned around . Our city leaders , school board and law enforcement have lost control of Macon. What we have here is some of the highest numbers in crime nationwide , near 50% dropout rate in school and and a tax base that dwindles daily because people and businesses are leaving . I hope things will change because it can be seen all across America , towns like Macon falling to nothing more than buildings boarded up , weeds and trash covering the sidewalks and streets not fit to drive on. Only the future will tell and I sure am not bashing Macon there is a lot to offer , y’all come visit some time just make sure to watch your back . @Chris I live in Macon too. I live and work downtown. I am also a member of the College Hill Corridor Commission which is working to revitalize the “College Hill Corridor” which is geographically defined as the neighborhoods between Mercer University’s campus and downtown. I certainly don’t think that Birmingham and Macon are the same, but I do appreciate your thoughtful response to our city. There are a lot of people working very hard to make Macon the jewel it yearns to be. Macon was originally designed to be “A City in a Park” and the resources and amenities are here because of that original concept. 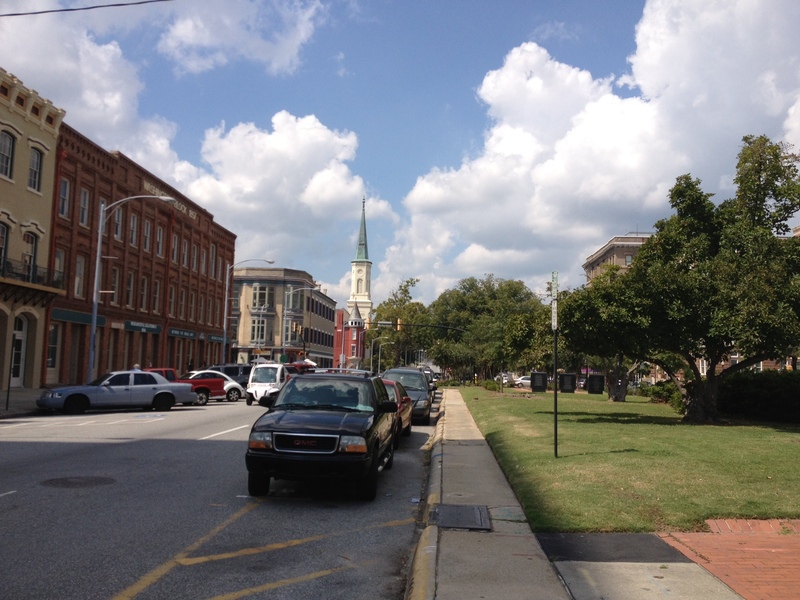 I love Macon, and I feel that love reaffirmed when outside eyes find lessons in our efforts. So glad to see you enjoyed your visit! i have family in B-ham myself and have always loved your town as well. I am a native of Birmingham, but have lived in Macon since 1985. Macon has a lot to offer – lots of historic homes, the Hay House, museums, Sports Hall of Fame, Tubman, and the BIG HOUSE – where the Allman band lived. Macon is not so busy that there’s a traffic problem, but big enough to offer a lot of shopping, restaurants, entertainment….and several great festivals – the Cherry Blossom Festival – one of the BEST! 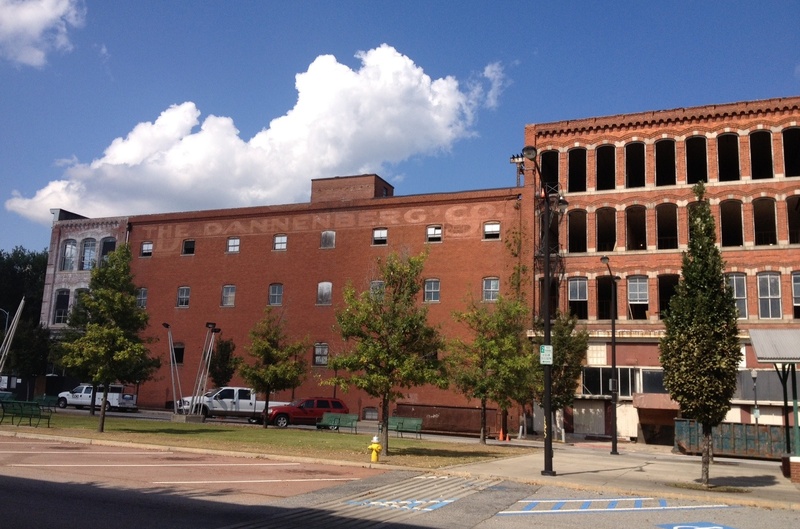 This was a wonderful article and spot on for downtown Macon! I lived many years in Warner Robins but two years ago took the plunge to move to Macon. (Waited until my daughters were adults as Bibb County still has much to work to do with the public school system). We bought a house in the Vineville Historic Distict – just 5 minutes from downtown and we love it! There is so much to do and we spend a lot of time downtown. 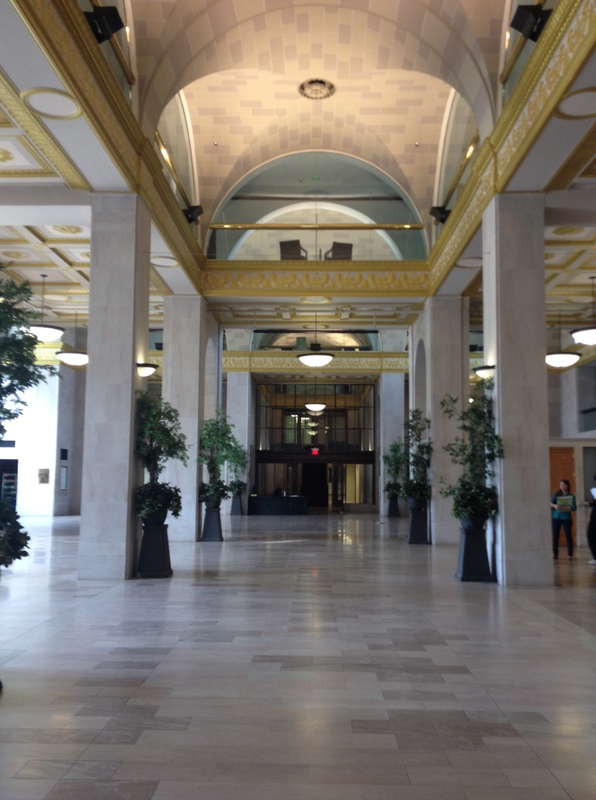 The restuarants are amazing – The Rookery is our favorite, there are galleries, live music, tours to take, and a lot more! Second Sunday is our favorite Sunday of each month with live music and picnic lunches in Washington Park. I do wish there were more shops, especially crafts, antiques, etc downtown. I would spend entire days down there shopping if I could. On Wednesdays there is the Mulberry St. Market with fresh produce and meat and other stuff. Macon has so much to offer and people who complain about it need to get off their duffs and see what great things this Southern city has to offer. 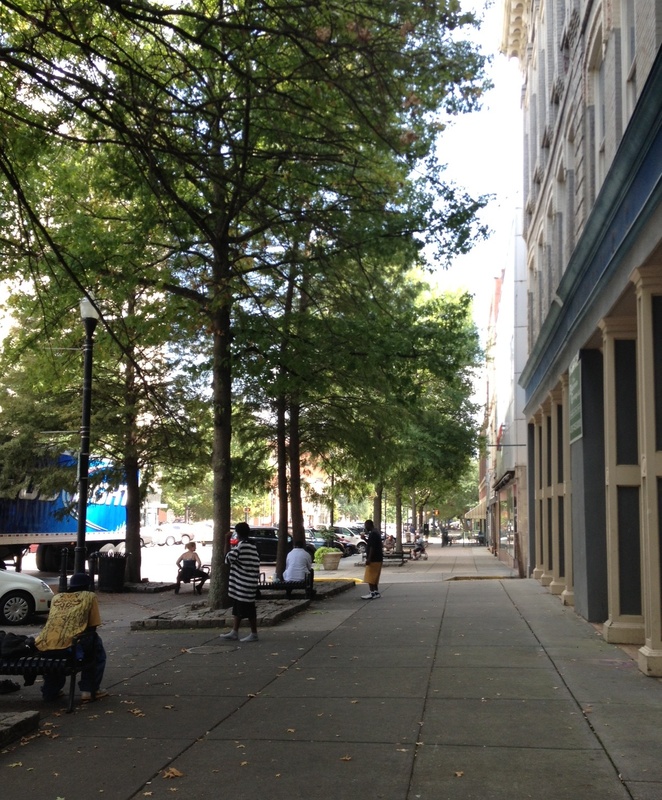 Macon just had a Charrete to work on the redesign of the 2nd street corridor. Here is the original report before the Charrete http://www.cityofmacon.net/sites/default/files/Mayor/2nd_street_corridor_concept_developement_phase_i_88128.pdf and here is the summary from the paper of the Charrete http://www.macon.com/2012/09/25/2191276/first-plans-aired-for-second-street.html Of course 2nd Street is only a part as there are several new restaurants opening in the next few months. Growth and redevelopment downtown has been on a very steady path for several years. One great blessing we have is all of the buildings that have been preserved.